Born in April 1452 in the town of Vinci, Leonardo da Vinci was the out-of-wedlock child of a legal notary and a peasant woman. His full name was Lionardo di ser Piero da Vinci. While relatively little is known about his early life, it is known that at the age of fourteen, Leonardo became an apprentice to the artist Verrocchio, whose workshop was famous throughout Florence. There, Leonardo was trained in a wide array of technical skills, including sculpting, painting, drawing, carpentry, mechanics, metallurgy, chemistry, and drafting. Leonardo was an eager student whose skill soon challenged that of his master; the story goes that after Leonardo�s collaboration with Verrocchio on the painting The Baptism of Christ, Verrocchio put down his brushes and never painted again. Leonardo became a master at the Guild of St. Luke in 1472. Da Vinci moved to Milan around 1482, where he began to take painting commissions, producing such immortal work as the Virgin of the Rocks and the Last Supper, as well as many other projects for his patron, Ludovico Sforza, the Duke of Milan. With the advent of the Second Italian War in 1499, Leonardo fled to Venice, where he became an engineer and military architect to help defend the city from attacks by sea. 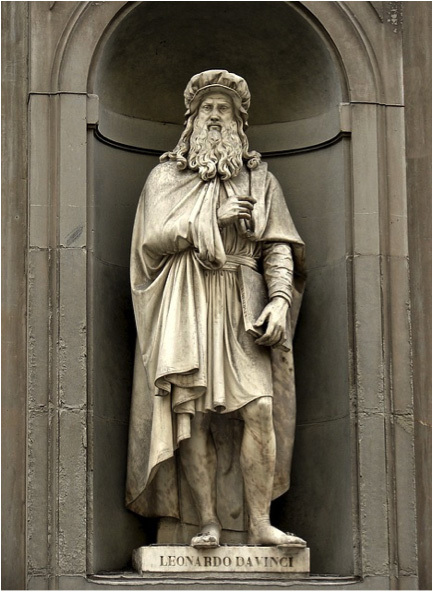 Leonardo briefly continued working as an architect and engineer under Cesare Borgia in 1502 before traveling between Florence and Milan. From 1513 to 1516, Leonardo lived in the Vatican under Pope Leo X, keeping company with Michelangelo and Raphael. Leonardo�s life was very private, and little is known about his relationships with women, aside from his friendship with Cecilia Gallerani and Beatrice and Isabella Este. His friends and associates included the mathematician Luca Pacioli and his two pupils, Salai and Melzi. Count Francesco Melzi, the son of an aristocrat, was reputed to have been Leonardo�s favorite pupil, who joined him in 1506 and remained at his side until Leonardo�s death in 1519 at the Clos Luc� in France. Although he is admired for the breadth and diversity of his talents, much of his fame has derived from Leonardo da Vinci�s paintings, which are among the most imitated and discussed works in the art world. Leonardo�s innovations of painting techniques in regards to light and anatomy have inspired countless artists throughout history. Leonardo�s earliest work is the aforementioned Baptism of Christ, painted in collaboration with his mentor Verrocchio. There are also two Annunciation paintings from this period, showing the Virgin Mary being visited by an angel. In the 1480s, Leonardo took on two commissions, which were never finished: St. Jerome in the Wilderness and the Adoration of the Magi, the latter of which was abandoned after Leonardo traveled to Milan. Another famous early work of Leonardo�s, the Virgin of the Rocks, took many years to finish. 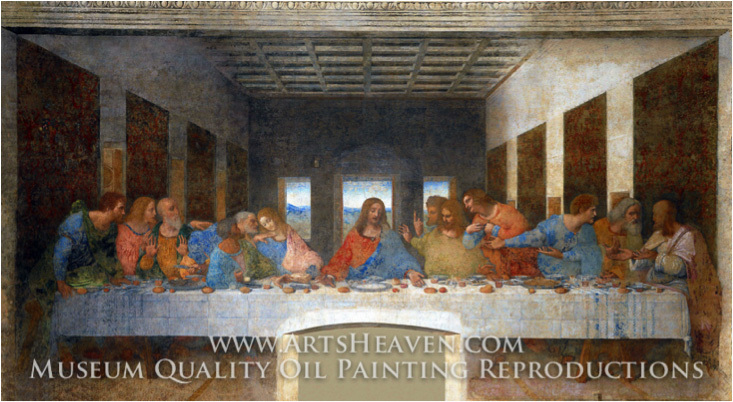 Among Leonardo da Vinci�s famous works are: The Last Supper, painted for the Convent of Santa Maria della Grazie in Milan in the 1490s, one of the most often-reproduced works in history; and the Mona Lisa (or �la Gioconda�), produced sometime between 1503 and 1506 and currently on display in the Louvre. While Leonardo did not produce many paintings during his lifetime, he created notebooks full of drawings and sketches. 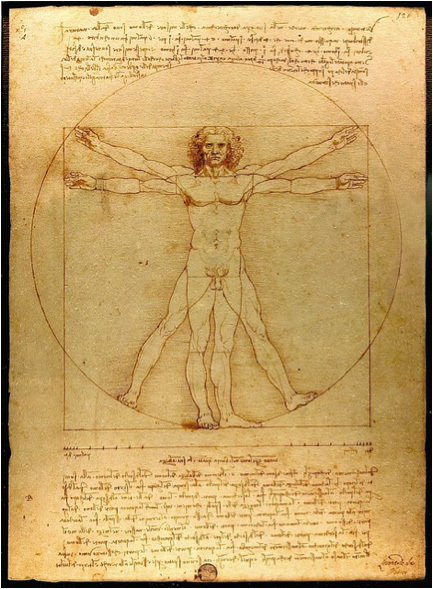 The most memorable drawing among Leonardo da Vinci�s famous works is the Vitruvian Man, showing the proportions of the human body. Leonardo�s notebooks comprise over 13,000 pages of notes and drawings, making observations on art, natural philosophy, engineering, anatomy, and other observations. Leonardo also cultivated many ideas for inventions, such as shoes for walking on water, flying machines, war machines, musical instruments, crank mechanism, mortar shells, hydraulic pumps, a steam cannon, a mechanical knight, and more. These notebooks have made their way into collections at the Louvre, the British Library, and even the personal collection of Bill Gates. These notebooks were not merely the work of an academic. Leonardo da Vinci enjoyed considerable success as an engineer in his lifetime, creating a system of movable barricades to defend Venice from attack in 1499 and devised a plan for a bridge to span the Bosporous that was abandoned at the time, but reproduced on another river in Norway in 2001. Leonardo was also fascinated with flight, and produced detailed studies of ornithopters, rotor-driven flying machines, and parachutes. 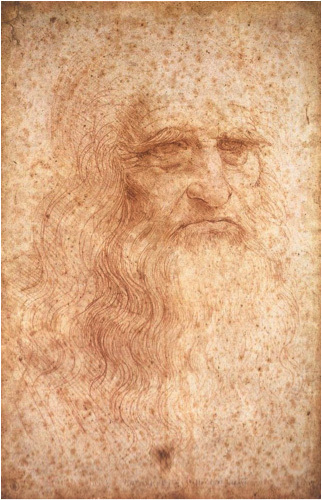 The work of Leonardo da Vinci is timeless. Many of his inventions have been reproduced in the modern era and proven successful -- British television station Channel Four, for example, produced a documentary constructing and testing many of the devices from Leonardo�s notebooks. 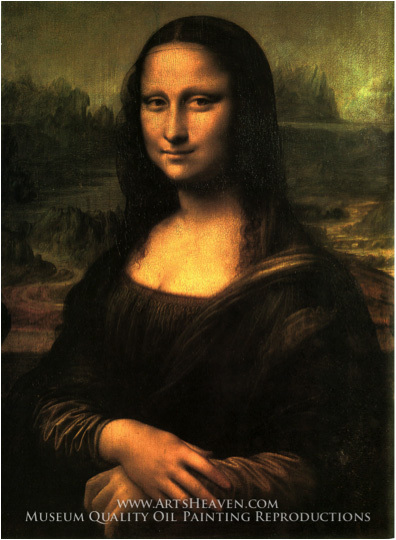 Leonardo�s artwork is still seen in popular culture and his style and technique continues to be studied and taught in schools around the globe. The Mona Lisa is one of the most recognizable paintings in the world, having been endlessly referenced in Leonardo da Vinci painting reproductions, prints, and parodies. Other artists, such as M�nageot and Jean Auguste Dominique Ingre, have even made Leonardo himself the subject of their work, creating paintings depicting the artist dying in the hands of King Francis I. Statues to Leonardo da Vinci have been erected in the Piazza del Scala in Milan and outside the Leonardo da Vinci-Fiumicino Airport in Rome. The bestselling novel and subsequent motion picture, The Da Vinci Code, creates a story of an extraordinary conspiracy based around Leonardo�s works. The art of Leonardo Da Vinci is some of the most popular art in the world, duplicated in numerous pop culture references and painting reproductions. Perhaps one of the best ways to introduce kids to the art of Da Vinci is to help them discover some of these references, such as the many permutations on the Mona Lisa or the Vitruvian Man on the Italian Euro, as well as showing one of the many famous Leonardo da Vinci paintings. There are also many art games, projects and activities available for kids online.